Memories of Watergate are fading among younger generations. Memories of the Iraq War may remain fresh as Americans assess further action. And opinions on immigration remain conflicted. 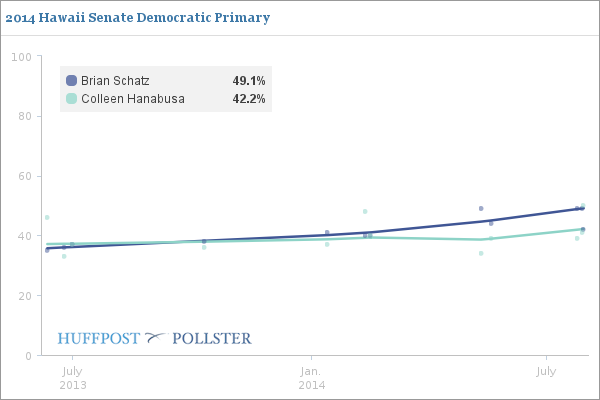 This is HuffPollster for Friday, August 8, 2014. Time, March 1974: How do you expect the Watergate affair to end, with Mr. (President) Nixon staying in office, resigning, or being impeached? Roper, August 1974: The week of August 5th (1974) was a momentous week. In a period of eight days former President Nixon admitted he had not told everything he knew (concerning Watergate). He became the first President in history to resign from office. Gerald Ford was sworn in as President and he made his first two speeches to the nation. Some feel it was one of the darkest weeks in the country's history. Others feel it was the rebirth of the nation. Do you regard it as a black week or a bright week in our history? A follow-up on methodology - Earlier in the week, the pollsters behind Merriman River, which released the survey giving Schatz the lead, laid out some of the changes they made after 2012, including a switch to a new list of voters' phone numbers that seemed to provide more reliable results among Americans of Japanese Ancestry. In an email to HuffPollster, pollster Seth Rosenthal fills in a few more details about efforts to reach cell phone users, and about the new list's higher match rate (the percentage of listed voters whose information includes a phone number): "The 2012 list was not obtained directly from the state, but rather through a secondary vendor who compiles a list from state records....The match rate for landlines on that list was higher than one-third, but not by all that much. We weren't incorporating cells into our IVR polls yet during the 2012 election, so I don't know any of the specifics about how many (if any) on that list were cells....When we started using cells, we obtained the lists from TargetSmart. They are also the provider of the 'new' landline lists referenced in the Civil Beat column. We use them for most of our polling now, except in states where we know we have exceptionally good local lists. Their database is also where I get the turnout targets I use for the demographic weights. TargetSmart has a much higher match rate in Hawaii. Not quite two-thirds, but in that ballpark. About 25% of their numbers in Hawaii are cells."